“I DID THE MONKEY BARS ALL THE WAY TO THE END!” was loudly broadcasted through my cell phone from my five-year old niece on a Sunday afternoon two Septembers ago. During a recent trip to visit my sister’s family, I went with them to the local public elementary school to register her children, my niece and her two older brothers, for the new school year. While their parents navigated the long lines outside of the school, I took the kids to the adjacent playground where within seconds I promptly lost all of them. Realizing my nephews had found their friends from the prior school year, I searched for my niece who did not yet have an established friend circle as an incoming kindergarten student. I spotted her eyeing the monkey bars. I encouraged her to give it a try. She grasped the first bar with both hands, swung her right arm to the first bar, then the left arm, balancing strength with physical and mental momentum. By the third monkey bar, she lost that momentum, dropped to the ground, and repeated this process five times, never making it to the end. When we got home, I decided to take this opportunity to have a conversation with her about how proud I was of her determination. The means of the conversation was letting her in on a “top secret” preview of my children’s book manuscript. 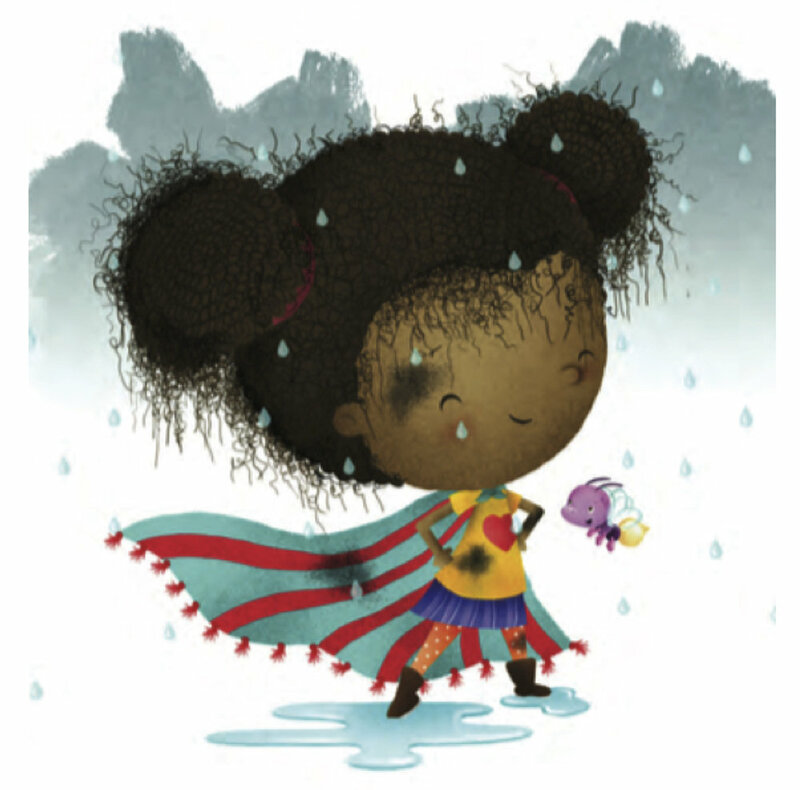 In my book, Nina the Neighborhood Ninja, the lead character is a young girl of color who is a superhero by using everyday powers of being smart, strong, and speedy. She takes charge by using her brains and muscles to solve problems. With creativity and determination, she makes it through a long and tiring day of mastering rescue missions. Usually, this storyline is centered on a male character. I wanted to put a female character front in center of a superhero adventure narrative to fill a void that is still quite prevalent. Even while half the United States is female, they are only included in less than half of children’s books. For example, less than a quarter of the “best children’s books of all time” are about a female character (https://bit.ly/2zrpVct). Even the comic industry in enjoyed by an audience that is split almost evenly between males and females, yet only a third of DC Universe and Marvel characters are female. It was a disappointing realization that girls like my niece, are excluded from the fun and adventurous storylines where they get to be the one saving the day. The thing that would strike me over and over again was that I see girls like my niece all the time in real life. We all know them. These are the little girls that embody the same superhero and adventurous traits we see in little boys. The question I could not figure out, was that why do we continue to only see boys in books portraying those traits, but not girls? If education is meant to be a social equalizer as Horace Mann famously stated, and we use books to educate children, then what are we in fact teaching children about their values and roles in society when we exclude a large portion of our population? On the shelves of children’s bookstores, it is very clear to see that stories confine both boys and girls to ideas who they can be and what they can accomplish. My goal in writing the book was that all children see themselves in books, validating their value in society. No longer should little boys and girls have to be given a limited image of what a hero is, but knowing that anyone can be a superhero, regardless of age, race, ethnicity, or gender. It was with this sense of inequity that I decided to create Nina the Neighborhood Ninja. My 5-year old niece drawing herself doing something strong as evidenced by mastering the monkey bars. Author Sonia Panigrahy (Pah-Nee-Grah-Hee), is a public health professional, world traveler, adventure seeker, and fitness enthusiast. Her motto is that life is too short to be bored! Nina the Neighborhood Ninja was created out of Sonia's lifelong love of reading. As her family and friends begin to have children, she looked forward to sharing this love with them. She believes that books are a powerful way to empower impressionable young minds. Sonia was surprised that she could not find books for kids ages 3-6 years that realistically identified females as intelligent, physically tough, brave, and adventurous. She was disappointed that girls continue to be excluded from the heart of the superhero story.